As fast as a hawk snatches a field mouse, a woman comes around to the front of her market booth, where I’ve stopped to look at an earring. It was dark, I wanted a better look. I let my guard down. “No thanks. Just looking.” I say. The earrings are nice, but it’s cold and I don’t have it in me to haggle right now. “Okayokay.” Before I can leave, the woman takes hold of my wrist and puts the earrings back in my hand. She picks up a calculator and punches in ’240′ – meaning 240,000 dong, over $14 US. When someone starts too high, as this woman has, I don’t even bargain. I make a face, say “No thanks,” place the earrings back on the table, and again turn to walk away. She did all the work in the one-sided bargaining, but we both left happy. She got a good price and I got a pair of handmade moon-shaped Black Hmong steel earrings for $3.50. Such is shopping in Sapa, which is about all there is to do in this small town once you’ve returned from a day’s hike. Stories of bad experiences with persistent touts are as ubiquitous amongst travelers to Sapa as photos of rice terraces. As Todd and I wander around town looking at restaurants, we’re drawn towards colorful hill tribe blankets displayed by a sun-wrinkled Black Hmong woman. Just pausing to appreciate the handiwork brings every other women in sight range over at a gallop. Like Homesteaders circling their wagons, a tribe’s worth of pleading women surround us with a wall of blankets. Except, instead of fending off an attack from without, they’re on the attack and we’re caught in the middle. Another hill tribe woman builds her sales pitch slowly over three days. In much-practiced English, she starts off with a long, friendly, and – by all indications – idle conversation. The next day she says “hello” and seemingly as an afterthought, mentions how, if we were, perhaps to buy something, she hopes we’d buy from her, but walks away without showing us anything. The third day, her youngest daughter tags along to talk about how much she enjoys being able to go to school. It’s then that we’re shown bracelets, bags, and pillowcases. The woman is masterful. It takes an enormous amount of willpower to resist some of the touts. Others are easy to ignore. With no pauses to allow Todd or I to answer, two tween hill tribe girls cry out in perfect unison, “Hello! Whatcountryareyoufrom? Whatisyourname? HowlongyoustayinSapa?” Todd imagines classrooms full of Sapa kids learning these English phrases by rote. 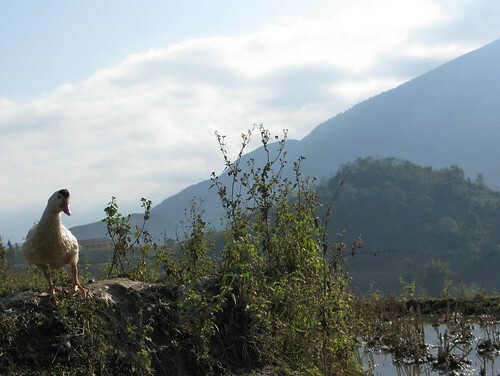 Todd and I escape Sapa town on a self-guided hike through farms and fields towards Ta Phin village. 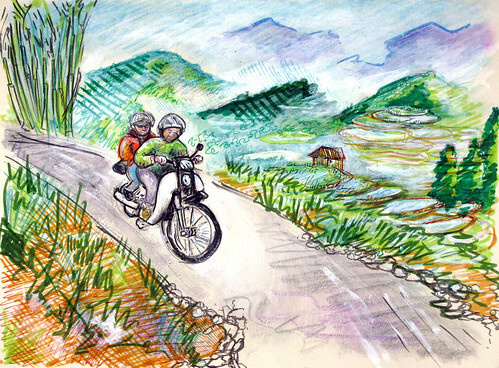 Since we arrived, Sapa’s famous views have been invisible, the fog impenetrable, the cold intimidating. We’ve heard rumors of the dramatic, mountainous landscape, but all we’ve seen is gray. As we descend into a valley, the gray steadily brightens. Remarkably, magically – finally! – the sky flips to blue as the fog retreats first behind the hills, then even further behind the mountains. It’s suddenly hot. We stop to strip off our layers since we each wore half of the clothes we brought with us on our round-the-world trip. The mountains appear flat, as if they’ve been cut from sheets of paper, shades of undulating deep blue-black like the dye the Black Hmong use on their clothes, which rubs off, staining their skin. Long into our hike, Todd and I are still surrounded by locals. 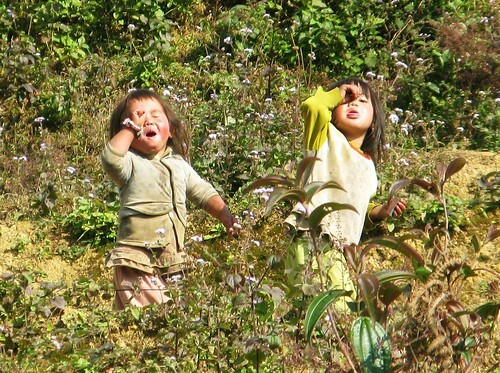 Young, muck-covered toddlers taunt us from rice paddy terraces. Farmers, busy spreading rice grains out to dry, barely give us a glance when we wave and say “Xin chào!” Clearly, they find us utterly uninteresting. 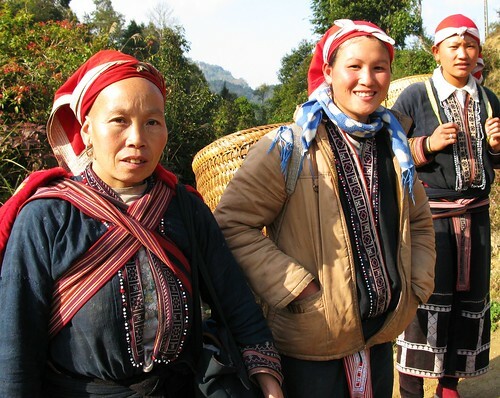 A trio of Red Dzao tribe women, their heads wrapped in red and white kerchiefs that remind me of Christmas, catch up with us on a path near Ta Phin. They lead us on a detour to their homestay house, where we’re treated to tepid water with a tint of tea, über-sour wild lychee-like fruit, the welcome company of two travelers from Dubai who are staying the night, and – of course – a brief, listless showing of a few handmade items for sale. If you can’t see the photo slide show above, view the photo set on Flickr. That lady was vicious! I also had similar experiences… but nobody EVER used my finger to type in numbers. This situation almost constitutes finger abuse! Yeah, she was vicious but it was still entertaining – somehow. If I’d been alone I would have been more freaked. Would have whipped out my best NYer beat down on her. Well, not beat down so much as loud cursing in her face. Glad you like the pics! I like your new(ish) site design. I’m looking forward to being home when I’ll have time to fix all the broken parts of this’ere site. Hey guys, how are you doing? Still in Sapa? it was freezing cold when I was there… but I liked it, even without having the finger abuse experience. Hey Aziz, Dang, it’s been a long time since you commented. That was just about when our internet got very slow and stayed slow for many countries. Sapa was freezing, but when we took our hike down into the valley it got sunny and warm. Then, we hiked back up, cold and misty again. We had to wear just about everything we owned at once to stay warm at night. We’ve been touting Tunisia to fellow travelers, you got us all excited about it. Hope to see you there one day.